Whatever you need to know about the Crystal Vision warranty, you'll find it here. The length of the warranty is one of the reasons why broadcast engineers choose Crystal Vision. For more information, view the Equipment Warranty and Service Support Conditions document now. What's the standard Crystal Vision warranty? 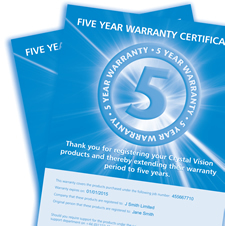 Crystal Vision offers a standard warranty of three years on its full product range. The back-to-base warranty covers all labour and parts, and is applicable to all modules, frames, power supplies, rear modules, fans, active frame front panels and remote control panels shipped from 1st December 2000 onwards. The Equipment Warranty and Service Support Conditions document was last updated in January 2014. How can I extend the warranty to five years? You can extend your warranty from the standard three years to five years, simply by registering your products on this website. It only takes five minutes and gets you an extra two years of warranty cover! Are my products eligible for the five year warranty? 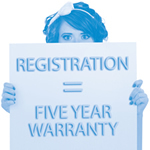 The extended five year warranty is applicable to products shipped after 20th August 2009 - and is available to those who register their products within 60 days of their shipping date.